Now isn't that sentiment the sweetest???? I stamped and paper pieced the cups and stacked them on top of each other! I just love these bright colors and the bold black lines! Tomorrow is the Big Release Party!!! Love this card Mackie! Bold and Gorgeous! Beautiful colors with the stacked coffee cups! And, awesome striped border! This is fab! Love this great design and super colours! 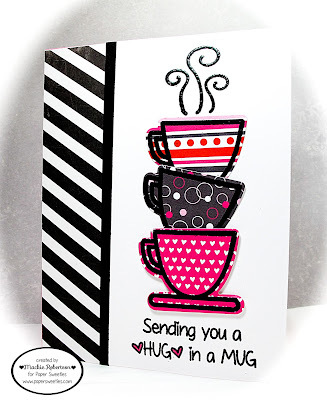 Your stack of patterned cups is darling!! This is a delightful card Mackie!! Love the stacked cups and the fabulous papers you used on them. So beautiful -- love the stacked cups and pink/black color palette!